Looking at the list of travel destinations Rajasthan offers Jodhpur does not come as an adventure land. Still, there is something in Jodhpur which other places do not have. The first thing one finds in the city is the blue color which spreads all over the city! Almost every house of city is painted in azure blue paint – the reason why Jodhpur is also called “The Blue City”. Standing on the top of the hill or while standing on the top of the Jodhpur fort one can really fantastic photos of the city or take selfies with the blue city in the background. This bluish tradition has been there for generations just like a ritual and is bound to be there for future to come. Be sure to be here and click some of the most awesome pics! The entire city is surrounded by a wall which is often compared to “Wall of China” as it is just second to the one in China! Amazing isn’t it! 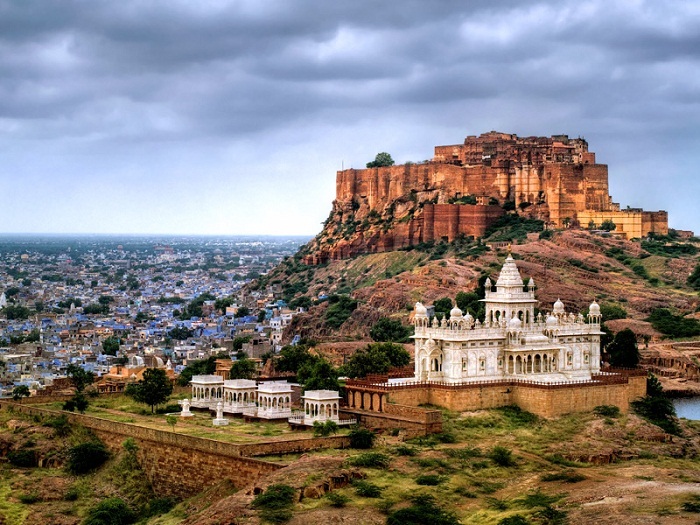 In this city, the first thing which one sees is the magnificent Fort of Mehrangarh. The 15th-century fort is an architectural marvel. Earlier a fort; now converted into a museum it houses weapons, elaborate sedan chairs, and tables, paintings, the royal dress of the king and queen and things of importance. Inside the fort are the two galleries located off Daulat Khana Chowk displaying ages old manuscripts, swords including that of Emperor Akbar, paintings, and other armors. 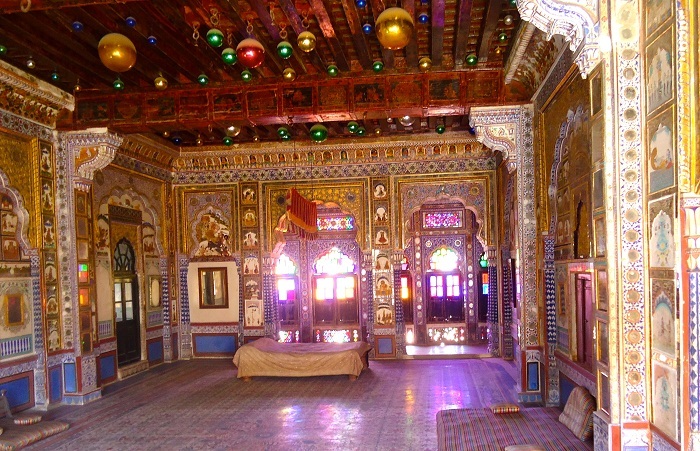 Above it is the 18th century Phool Mahal with wall paintings of 36 moods of classical ragas as well as a unique painting of gold leaf and glue. Then there is Takhat Villas or the bedchamber of Maharajah Takhat Singh. There is zenana or queens room with latticed windows featuring 250 different designs. There is also the Cradle Gallery with beautifully crafted cradles for infants. The fort also includes Moti Mahal and Durbar hall which are a must see. The fort opens in the morning around 9:00 a.m. so one has a lot of time to see around. The second best place is Umaid Bhawan Palace which is to this day the Royal Residence of generations of King of Maharajah. To this day the royal family celebrate their family and royal traditions and parties are organized here. Only a portion of the Palace is open which has been converted into Museum which includes a splendid display of Vintage Cars, temperature controlled swimming pool and the Umed Cafe which invites visitors to have a Royal Cup of tea or Coffee. Maharaja Gaj Singh II the present Maharajah of Jodhpur is a foodie; so the Royal Cafe has always something distinguished coming up. 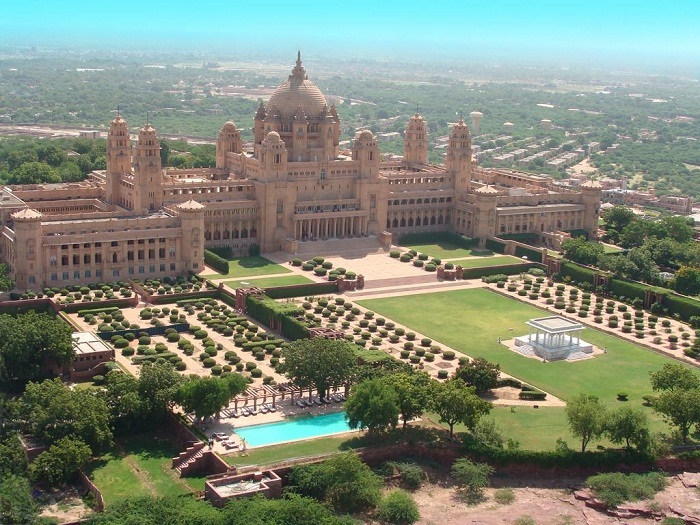 The palace which took 3000 workers working over 15 years and coasted around 11 million INR was basically built to help drought – written Jodhpur city at that time. Next is Raojodha Desert Rock Park. A 72-hectare park is a showcase of intellectualism takes you up to city walls just around Devkund Lake. It’s the best place to be in winters especially at evening time. 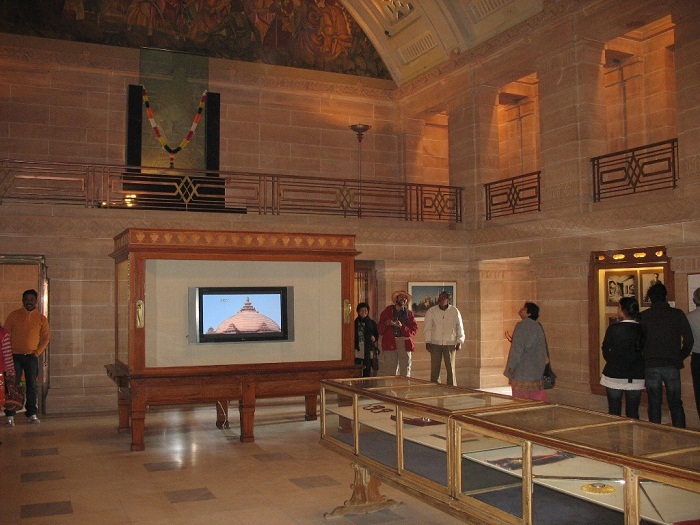 There is an admission fee of 100 INR with a guide and is open from 8: 00 a.m. – 6:00 p.m. 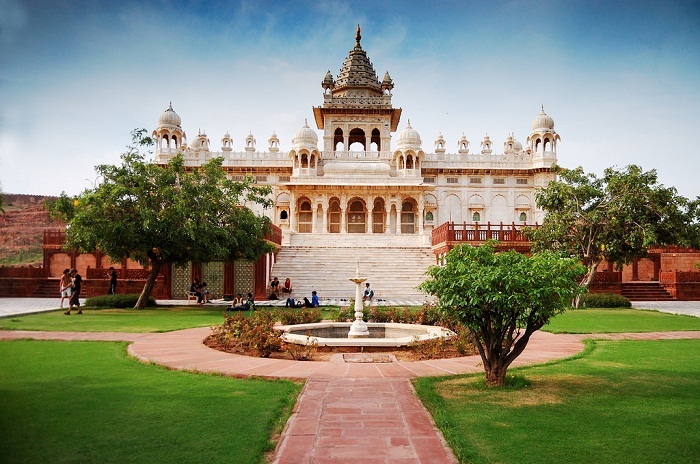 When you are in Jodhpur, do not forget to visit Jaswant Thada – the white marble memorial of Maharajah Jaswant Singh II; is a beautiful array of whimsical domes. Standing here one can see a spectacular view of the entire city. Being here gives a perfect insight of Rajasthani architecture and design. Built in the year 1899, these cenotaphs have some of the most beautiful marble lattice screens one has ever seen. One of the most interesting things is the memorial of a peacock that is believed to have flown into the funeral pyre of a Maharani/Queen of Jodhpur. Sardar Government Museum is the ages old landmark located in Umaid Garden Park. Filled with 10 the century sculptures and stuffed animals; it’s another marvel of this city. 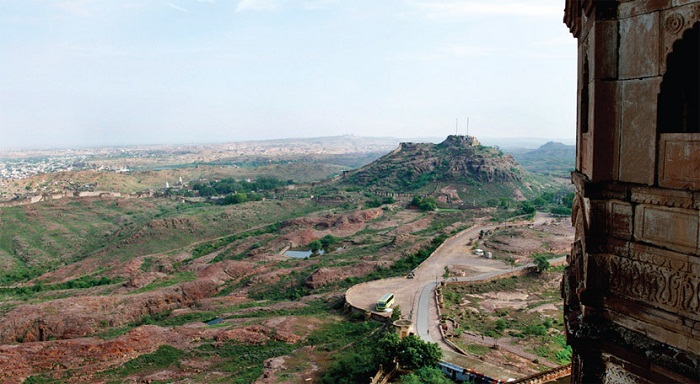 Other landmarks of Jodhpur include Sachiya Mata Temple and Jai Pol. For those love shopping, there are so many things to shop around. Shopping can be really interesting and time – taking. Shop here for spices (people take loads with them), traditional glass work skirts and tops, contemporary art and miniature paintings, carpets and shawls, handicrafts, blue pottery and colorful headgears. Including the beautiful things in the city are the hotels which are a perfect reflection of ages old Havelis. In fact, it would not be wrong to say that it is some of the Havelis which have been converted into present day Havelis. So, it’s a good idea to choose a heritage haveli hotel when you plan a trip to a culturally rich destination like Jodhpur. From 2 star to 5 star (Umaid Bhawan Palace – a portion of it has been converted into 5-star hotel) hotels; there are all categories of hotels in the city. 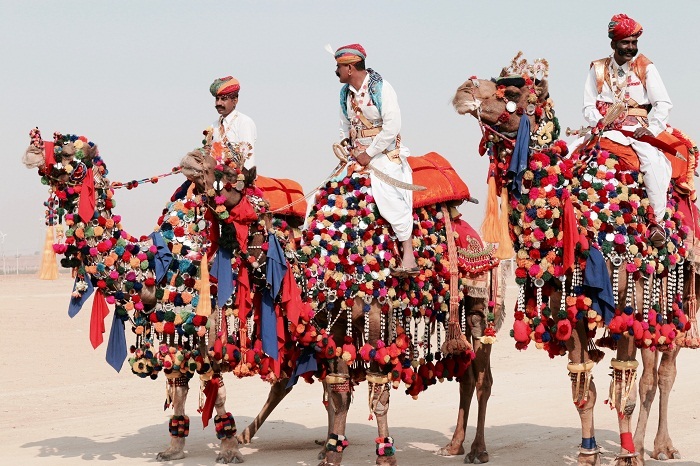 Jodhpur is also known for its Pushkar Camel Fair which sees thousands of camels being sold and bought all around. The fair which beings 10 days just before Indian festival of lights – DIWALI is a much – awaited fanfare. Another main attraction is the Thar Desert Camp where people enjoy the ethnic dance, music, and cuisine of Rajasthan in the over- night stay of desert camps. Check with your tour operator to get the details and do not miss this one out! It takes around two days to cover the all the destinations of the city. However, it’s a good idea to be here for at least 3 – 4 days if you wish to enjoy the Rajasthani hospitality and to know the true culture of this colorful desert city. Explore the complete list of best places to visit in Rajasthan. Book online various types tour packages life wildlife, history, forts and festivals tours with the best price guarantee.